Over 45 years of Experience and Expertise with Ukuleles and Banjo Ukes. I am always looking to buy and sell really good quality Banjo Ukes and Ukuleles as well as any other nice instruments. 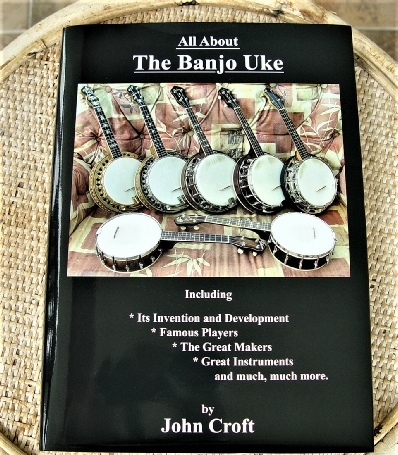 I have been interested in Ukuleles and Banjo Ukes for over 45 years, and for a long time it has always been very difficult to find good quality instruments. So, when I started my website early in 2001 my aim was to try and provide a range of excellent quality instruments of all ages and across all price ranges, something that I continue to try very hard to do. This website and all of its contents (past and present) are owned by John Croft (full contact details shown below ‘The Ukulele Man’ banner at the top of every page). None of the contents of this website (past or present) may be reproduced in any form whatsoever without first obtaining written permission from the owner and producer of this website and its contents, John Croft. Site Design & Build by John Croft. Links to full details about my new book are given below this photo. * Please click HERE for full information and photographs. ** For Sales Information please click HERE. *** Important: All Postage and Packing charges are at Cost Price. SOLD: ULURU PUKARA LA Tenor Ukulele (c.2012). A twice yearly get-together for anyone interested in the Ukulele or the Banjo Uke. * Doors Open at 11am and usually close around 7.00pm. * Only 5 minutes from Junction 6 of the A1(M). * Just 50 metres from Welwyn North Railway Station. * The USGB encourages all types of music and styles of playing on the Ukulele or on the Banjo Uke. * Entry includes Lunch as well as Afternoon Tea and Cakes. * Organised Afternoon and Evening Concerts. * Loads of time to meet New Friends, Compare Instruments (old & new) and have a real good natter! * Long Established, Welcoming, Friendly, Really Sociable & Great Fun. * Books, Instruments, Bridges, Strings & Case Handles for sale by yours truly! * Ample Parking available nearby. * Enjoy all styles of Banjo playing. * Doors open 12 Noon. * Concert starts about 1.30pm.